(Newport, RI)- In case you had not seen the worldwide introduction of the J/99 in last week’s newsletter, here is more information for you to consider. 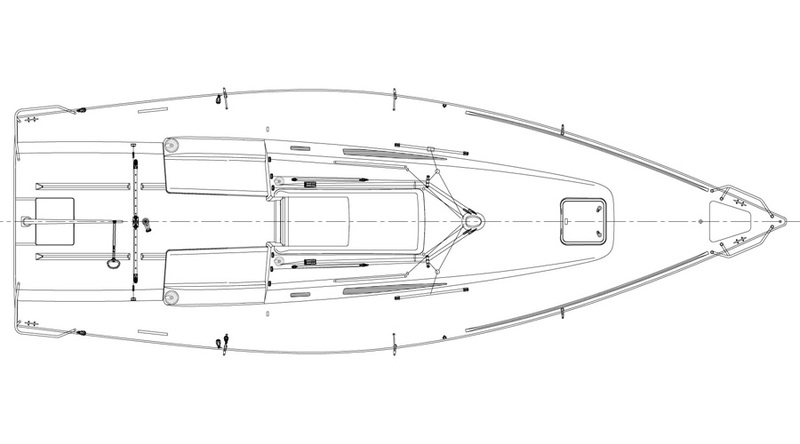 The J/Design team has finalized more details on the deck and interior design that make for a very comfortable boat to daysail, weekend cruise, as well as race offshore short-handed. 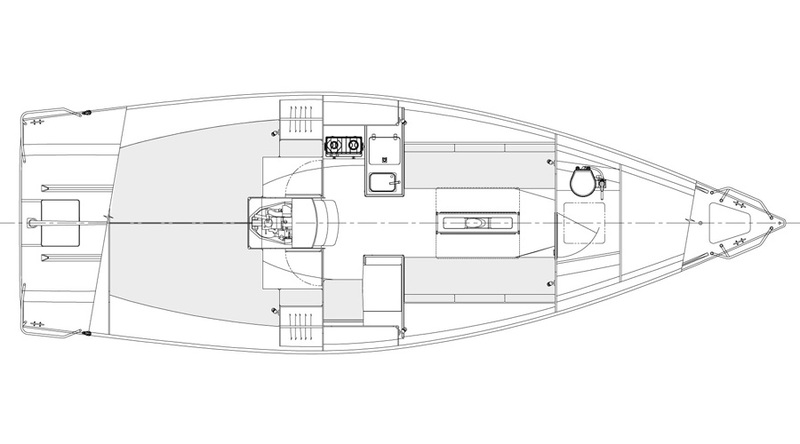 The J/99 is the newest addition to the J/Sport range, combining standing headroom and comfortable interior accommodation with the tiller-driven responsiveness of a sport boat. 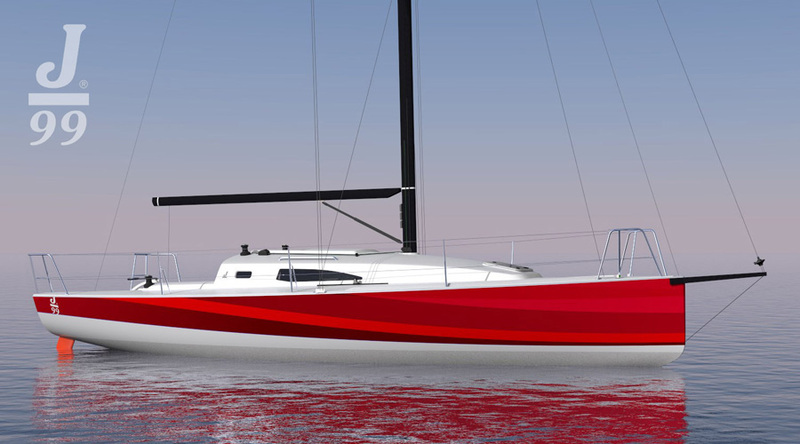 The sail and deck plan are optimized for easy handling with fewer crew, and incorporate the latest developments from the award-winning J/121 and the new Offshore Sailing World champion J/112E. 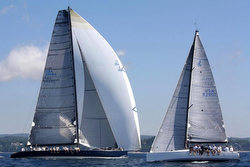 (Cowes, Isle of Wight, England)- Cowes Week is one of the UK’s longest running and most successful sporting events and is a key highlight of the British sporting summer. It has been held in early August every year since 1826, except during the two world wars. (St Petersburg, Russia)- With World Cup football fever still fresh in the memory, now Saint Petersburg Yacht Club and Russia’s most beautiful city get ready to host 24 international clubs representing 12 nations at Semifinal #2 of the SAILING Champions League 2018. 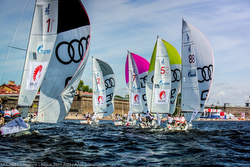 With four days of racing scheduled from 3 to 6 August, the setting – right in the center of St Petersburg – couldn’t be more spectacular. The top 16 clubs win a ticket for the big Final of SAILING Champions League in St. Moritz, Switzerland (30 August to 2 September). St. Petersburg is the former Russian capital whose mysterious White Nights and winding canals inspired such literary giants as Fyodor Dostoevsky and Nikolai Gogol. Constructed from scratch out of marshland in 1703 by Peter the Great, St. Petersburg has seen more revolution, war and political intrigue in its 350 years than other cities witness in a millennium. This history is apparent at every turn. Nowadays this is one of the largest European cities where history is combined with modern. Besides, St. Petersburg is the unofficial sailing capital of Russia. Some of the competitors were in St Petersburg only a few weeks ago when they were sailing into the finish of the 1,000 nautical-mile Nord Stream Race through the Baltic Sea. Sergey Musikhin was co-skipper of the winning boat representing Russia, and three weeks after winning the Nord Stream Race, the 35-year-old is back at the helm of his team, Lord of the Sail– Asia. The strong current of the fast-flowing Neva River will play a strong role in the strategy and tactics used by the teams for advantage around the race course. St Petersburg Yacht Club (SPYC) is hosting SAILING Champions League for the third consecutive year. With support from main partner Gazprom, SPYC presents sailing at its best in the maritime capital of Russia, with the locals always ready to support the best European clubs racing close to shore. Crews are representing the following countries: Austria (SCTWV Achensee/ Union YCV Woerthersee/ Union YC Wolfgansee), Denmark (Frederikshavn Sejlklub), Finland (Brando Selgare/ Mariehamns Seglaforenig), Germany (Deutscher Touring YC/ Norddeustcher Regatta Verein/ Segelkameradschaft Das Wappen von Bremen), Great Britain (Royal Ocean Racing Club), the Netherlands (VWDTP Groningen), Norway Asgardstrand Seilforening/ Tonsberg Seilforening), Poland (YC Sopot), Russia (Lord of the Sail- Asia/ Lord of the Sail- Europe/ Navigator Sailing Team/ PIRogovo/ St Petersburg YC), Slovenia (JK MIPC), Sweden (Hjuviks BK/ Kungliga Svenska Segelsällskapet) and Switzerland (Seglervereinigung Kreuzlingen/ Societe Nautique de Geneve). We spoke with Elena Solovyeva, Project Manager from to St. Petersburg YC, the host club for this year’s Semifinal 2. 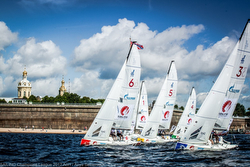 SCL: What abilities do the sailors/clubs need to win in St Petersburg? SCL: What has SPYC prepared for the semifinal? SPYC: “This is definitely the most challenging race course of the season. Also, St Petersburg is the largest city in the SCL calendar. The city offers unique attractions for the visitors, like keeping an eye on the clock at night to not miss crossing the bridges! Besides, based on the crews’ feedback, we strongly believe that the clubs seeking to qualify for the SAILING Champions League Finale in St Moritz, Switzerland also love to visit our beautiful, fun, and historic city. SCL: For SPYC, what is the significance of hosting the SAILING Champions League? As with all SAILING Champions League events, the final two days of racing on Sunday and Monday will be live broadcasted by SAP from 12:00 hrs (UTC+3), with expert commentators providing blow-by-blow analysis of the racing, aided by the detail provided by SAP Sailing Analytics. The SAP Sailing Analytics provide 24/7 additional statistics and data for sailors, fans, spectators and media like GPS tracking, real-time analysis, live leaderboard combined with 2D visualization. You find all results on sapsailing.com! 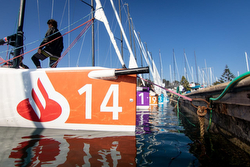 Sailing photo credits- Anya Semenyk You can follow the action on Sunday here, then follow the action on Monday here. (South Dartmouth, MA)- On behalf of the Beverly Yacht Club and New Bedford Yacht Club, the Regatta Chair welcomes all sailors to a new era of the Buzzards Bay Regatta! After 45 years of alternating locations annually, the organizers have decided to stage an event that spans the entire Bay- from the Cape Cod Canal to Buzzards Tower! 2018 will feature spectacular racing out of both Beverly Yacht Club and New Bedford Yacht Club, with 13 fleets of boats on 7 circles, and racers that span from 20-ton cruising boats to foiling kiteboards!! 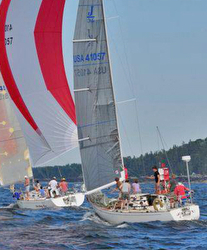 The regatta expects over 200 boats (boards) and 1,000+ sailors! Off the water, there will be tent festivities at both venues, with live music, food delights, and full-tilt regatta bars! The J/80 Class includes Dan Cooney’s AMERICAN PRAYER, Peter d’Anjou’s LE TIGRE, and Jim Shachoy’s PEARLY BAKER. The J/105 New England Championship will include Mary Schmitt’s HARDTACK, Mark Lindquist’s STERLING, Ed Lobo’s WATERWOLF, and the trio on DARK’N’STORMY (Andrew Reservitz, Eric Wagner, & Ned Joyce). 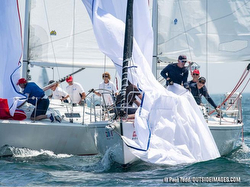 The PHRF New England Racing division will have five J/teams, like two J/109s (Cory Eaves’ FREEDOM and Dan Boyd’s WILD THING), the J/121 INCOGNITO (Joe Brito), Doug Curtiss’ J/111 WICKED 2.0, and Ira Perry’s J/29 SEEFEST. 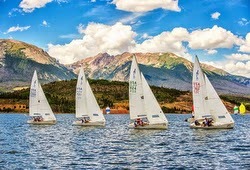 (Lake Dillon, CO)- At a mile-high, there is no question that Dillon YC’s annual “Dillon Open” that is sailed on the Dillon Reservoir west of Denver high up in Rocky Mountains, is the longest-running highest altitude regatta in the world. Yet again, a great of brave sailors on J/22s and J/24s look forward to sailing in one of the world’s most challenging sailing venues. Ringed by 10-14,000 ft snow-capped mountain peak off the north, west and south, the winds can be capricious and unpredictable at best, if it’s from any of those quadrants. About the only “normal” breeze that whisks across the lake comes from the southerly quadrants since the winds would not be swirling down off huge mountain peaks, down the slopes and on the lake surface. The winds from the “hard” part are famous for “helicopter” puffs (seemingly mini-tornados) as well as vertical puffs- a.k.a. violent “micro-bursts” that drop out of the sky and knock boats flat out-of-the-blue, so to speak. Nevertheless, the sailing and the vistas are spectacular! Eight J/22s, the biggest fleet in years, are registered to sail the event. In fact, a few “rock stars” from afar will be in attendance; namely Reed Baldridge from the College of Charleston YC in Charleston, SC. He will be up again the smart local teams, such as Tito and Mateo Vargas on BABY DOE, Mike & Robyn Kline on NAUTI-MOOSE and Phil Cooper’s SWEET BABY-J. 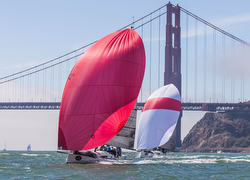 (San Francisco, CA)— It’s hard to find a purer form of sailing than a lineup of polished teams on identical platforms, all with an equal shot at race course glory. This is precisely what makes One-Design racing the heart and soul of the St. Francis Yacht Club’s annual Rolex Big Boat Series. From September 12-16, top teams will race in at least seven different One-Design fleets, as well as several highly-competitive handicap fleets, making this the West Coast’s most competitive regatta. J/88s, J/105s, J/111s, and J/120s have all met the NOR requirement of six or more entrants for One-Design class racing! Held on San Francisco Bay’s beautiful, but always challenging waters, prepared teams who know how to press their boats hard will benefit from the conditions by creating micro-advantages in fleets that define the term “stacked”. The J/105 class has shown impressive pre-event motivation, with 22 boats currently registered and more expected. While not all classes can draw the numbers of the J/105 fleet, the J/88 class pulled enough entries to enjoy their inaugural Rolex Big Boat Series as a One-Design class. The end of July is a very busy one in the Americas. There was a lot of action taking place from the Right Coast to the Left Coast and parts in between. For starters, off to the east the annual Helly Hansen Marblehead NOOD Regatta was hosted by the triumvirate of their amazing yacht clubs (Boston, Corinthian, Eastern) for fleets of J/70s, J/24s, and J/105s. 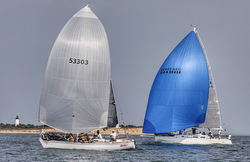 Just further south on Cape Cod, the Edgartown YC hosted their annual Edgartown Race Weekend was held that featured their classic Round the Island Race (of Martha’s Vineyard) for the big boats and the new Round the Sound Race for smaller boats (e.g. a J/70 class). Heading towards the Midwest, we find the annual CanAm Challenge Regatta was hosted by the Youngstown YC in Youngstown, NY at the western end of Lake Ontario. The event featured the J/88 Great Lakes Championship and the J/70 Lake Ontario Championship and a fleet of J/22 one-designs. Heading deeper into the Midwest, we find three HUGE regattas. 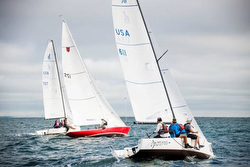 For starters, the J/105 North Americans were held in Harbor Springs, MI, hosted by Little Traverse YC. 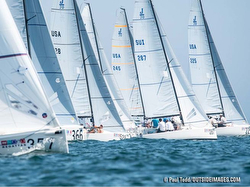 Simultaneously, at the same venue, the LTYC hosted their annual Ugotta Regatta for fleet of J/70s and J/111s and PHRF offshore handicap racers. Then, on the eastern side of the Michigan peninsula, the J/35 North Americans were hosted in Cheboygan, MI, by the North Star Sailing Club. Out West, there was the popular Santa Barbara YC offshore event- the 90nm Santa Barbara to King Harbor Race for a hot fleet of J/125s, J/111s, J/120s, and others. 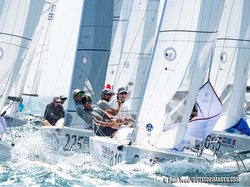 Down in South America, the first regatta in the Santander Bank J/70 Winter Series took place on the Pacific Ocean off Algarrobo, Chile, hosted by the Cofradia Nautico del Algarrobo. In Europe, the signature event was Travemunde Week sailed in Travemunde, Germany on the beautiful Baltic Sea, hosting the inaugural J/70 Youth SAILING Champion League for eighteen youth sailing club teams from nine nations across Europe! Read on! 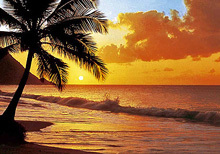 The J/Community and Cruising section below has many entertaining stories and news about J/Sailors as well as cruising blogs about those who continue to enjoy the Caribbean and the South Pacific, staying warm while others are trying to stay warm up north. Check them out! 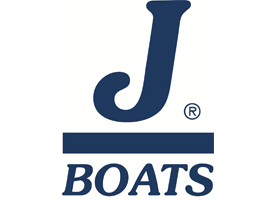 More importantly, if you have more J/Regatta News, please email it or upload onto our J/Boats Facebook pag Below are the summaries. 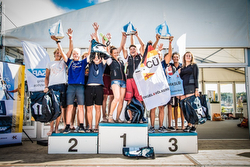 (Travemunde, Germany)- The Youth SAILING Champions League was the latest innovation to be launched out of the successful SAILING Champions League format, and eighteen crews from eight nations raced each other in Travemünde, Germany, from 27 to 29 July. 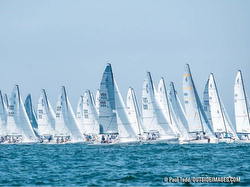 The first-ever league competition exclusively for sailors from 16 to 23 years old at Travemünde Week attracted prestigious yacht clubs from Austria, Croatia, Denmark, Finland, Germany, Italy, the Netherlands and Switzerland. Some of the yacht clubs were already well-versed in the short-course windward-leeward style of racing the fleet of J/70 sportsboats. 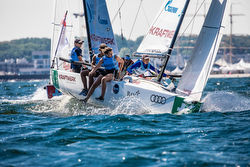 The Royal Danish Yacht Club (Kongelig Dansk Yachtklub) recently won the inaugural event in the Women’s SAILING Champions League at Kiel Week, in addition to also leading the overall standings at this stage of the Danish National Sailing League 2018. After three days of intense competition and a nail-biting four-boat finale, it was the Bodensee Yacht Club Uberlingen from Germany’s Lake Constance that won the first ever event in the Youth SAILING Champions League after a stellar performance in Travemunde. Kongelig Dansk Yachtklub from Denmark was the runner-up ahead of fellow Danish team from Roskilde Sejlklub in third place. Bodensee YC’s young crew consisted of helmsman Konstantin Steidle, Alexandra Lauber, Patrick Hasse and Jonathan Koch. The team went into the finale as the third-ranked club, but secured the overall win. For the leading group, the final day was all about making sure you had done enough to make it through to the four-boat finale. After twelve flights with 36 races, the final was a battle Denmark vs. Germany: the Kongelig Dansk Yachtklub (KDY) and Roskilde Sejlklub from Denmark against Bodensee Yacht Club Uberlingen (BYCUe) and Lindauer Segler Club from Germany. The new Finals format means that your overall position from Qualifying is taken into the Final Series. So as winner of the Qualifying Series, KDY carried through a first place and hence already one race win. Whichever of the four clubs secures two race wins would become the overall champion. In the first final race, BYCU won, putting them level with KDY, the winner of Qualifying. The other two yacht clubs were really starting to feel the heat, desperately needing a win in the next race. In final race 2, BYCU earned her second race win, giving the young crew from Germany the overall victory. Over the three days, the clubs experienced all kinds of wind conditions: from Freaky Friday, with the wind averaging 17 knots and gusting quite a bit more at times with big waves – it was a day to hang on to your hats – to lighter airs on Saturday and Sunday, putting a greater emphasis on tactics. J/70 AFRICA Crowned Marblehead NOOD Overall Champion! (Marblehead, MA)- The 2018 edition of the Helly Hansen Marblehead NOOD Regatta was not without its dramas for the huge 57-boat J/70 class as well as the talent-laden J/24. 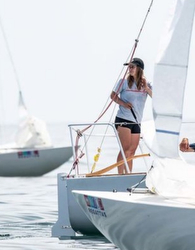 Hosted by the triumvirate of clubs in Marblehead (Eastern YC, Corinthian YC, Boston YC), the regatta PRO’s managed to get off six races over the first two days for the J/70s, seven races for the J/24s and eight races for the J/105 classes. In the end, it was local hero- Jud Smith- and his very talented crew onboard the J/70 AFRICA that not only won their class, but were also awarded the Overall Marblehead NOOD Champion Award for best performance at the regatta. As it turns out, Jud and crew now have a chance to race a “party catamaran” in the Caribbean for the Overall NOOD Championship from all the other NOOD regattas nationwide. Here is how it all went down over those three days of racing. Spectacular sailing conditions marked the first day; gentle breezes and moderate seas made for a full day of close racing, as crews stayed on the water late in order to fit in the maximum number of races possible- like finishing at 1700 hrs late! Among the eight classes competing on Friday were the popular J/70s. The pro-laden fleet was the largest of the regatta and, for them, this regatta had an added layer of importance. In addition to vying for the overall prize, teams in this class were training for the World Championship in Marblehead this September. Local skipper Jud Smith, who led the fleet after three races, said this event was critical for J/70 crews to get a feel for the rest of the fleet and get used to the venue— even local sailors, like himself. Smith and his team on AFRICA haven’t been sailing together long and are hoping to continue working out the kinks this weekend as they prepare for the class championship. Before leading his own crew, Smith served as strategist on the J/70 World Champion team in 2017, alongside skipper Peter Duncan, who currently holds the second spot in the fleet only three points behind team AFRICA. For Duncan, the Marblehead NOOD is a fun opportunity to go head-to-head with his friend and former teammate, and a can’t-miss opportunity to train for this year’s championship. For the second day in a row, consistent winds fueled a full day of races on Saturday. With slightly more wind than Friday, plus light waves and current, fleets kept very close for tight racing and crowded mark roundings on the race course. When winds are moderate and less physically demanding, boatspeed differences tend to be minimal between competitors, which result in close-quarters racing and passing opportunities. In these conditions, however, it’s the best teams that tend to demonstrate their strengths. Local J/105 skipper Charlie Garrard wasn’t getting comfortable just yet with the weather conditions. He led the fleet by two points and credits his success so far to the help of his kids, who are sailing with him, and a focus on finding clear air on the racecourse. The largest of 10 fleets competing in this year’s event, the J/70 class saw extremely close racing again on Saturday, especially during mark roundings. 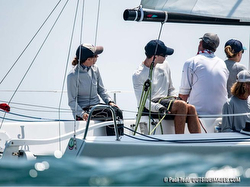 Former J/70 World Champion Timothy Healy and his crew on USA 2 staged an impressive comeback to move into second place overall after posting uncharacteristically high scores on Friday’s first day of racing. Team USA 2 had one fifth and two first-place finishes on Saturday. The crew hasn’t sailed together before, so it’s also been important for them to gel and improve communication. Though early morning winds appeared promising, the breeze disappeared and never returned for the final day. As the winner of the largest, most competitive class in the regatta, J/70 skipper Jud Smith and his crew on Africa earned the coveted Overall Winner prize. In addition to new gear from Helly Hansen, the Swampscott, MA, native and his teammates earned a berth in the Helly Hansen NOOD Caribbean Championship regatta, hosted by Sunsail in the British Virgin Islands in October. The team won by a considerable 14-point lead, but success didn’t come without its challenges. Their big focus this weekend was to start well and consistently – and when that didn’t happen, they had to rely on good communication and teamwork to pull them through. One particularly bad start on Saturday saw team Africa behind the majority of the 57-boat fleet, but the crew was able to battle back to the weather mark and finish in 13th place. 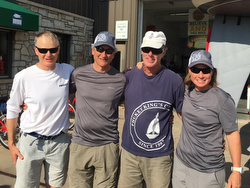 Smith has been sailing with Marc Gauthier (bow) and Will Felder (trim) for years; in fact, they won J/70 North Americans together in 2015. But tactician Lucas Calabrese — a 2012 Olympic sailing bronze medalist in the 470 class — is a recent addition to the team, and Smith said Calabrese has helped the crew step up its game. Team Africa also won the 2018 J/70 New England Championship this weekend, which had greater than usual significance for Smith and his crew. After taking the year off from driving in 2017 to sail with Peter Duncan’s team — and winning the J/70 World Championship in Italy along the way — Smith said he was “pretty rusty” when he returned to his boat in February. This win is a symbol of his progress. Behind Smith’s AFRICA and Healy’s USA 2, it was another J/70 World Champion that took third place- Joel Ronning’s CATAPULT from Lake Minnetonka, MN. Rounding out the top five were Peter Duncan’s RELATIVE OBSCURITY in 4th (current J/70 World Champion) and Oivind Lorentzen’s NINE from Long Island Sound. 7th- Brian Keane’s SAVASANA- 3x College All-American & J/80 North American Champion/ Thomas Barrows was College Sailor of the Year at Yale. 17th- Jack Franco’s 3 BALL JT- 2x College All-American/ Bill Hardesty- Etchells-22 2x World Champion & J/70 World Champion tactician/ Allen Terhune- J/22 World Champion. ALL of these teams are sailing the J/70 World Championship. Then, consider what the European teams are bringing to the table- a few guys with more World Championship credentials on their C.V.’s; such as Paul Goodison (British Olympic Gold Medallist in Lasers and 2x Moth World Champion, Laser World Champion, Melges 32 World Champion- tactician) and Cameron Appleton (Kiwi tactician winning 3x Farr 30 Worlds and 2x Melges 32 Worlds), just to name only a few. Watch interview of Jud Smith from AFRICA here. In the J/70 Corinthians Division, it was yet another win for Jenn & Ray Wulff’s JOINT CUSTODY from Annapolis, MD. Second was Stein Skaane’s SHRED, a local boat from Marblehead. And, third was another local team- Daan Goedkoop’s LOCOMOTION. Watch interview of Jen & Ray Wulff’s JOINT CUSTODY here. In the J/105 class, Charlie Garrard’s MERLIN ultimately took the class after posting a 1-2 in the last two races. Second was Mark Lindquist’s STERLING and third Jon Samel’s BLOWN AWAY. (Harbor Springs, MI)- It was not the “Thrilla from Manila”, nor was it the “The Rumble from the Jungle”, as many had anticipated for the clash between two North American Champions, heavyweights in their hyper-tuned, hyper-faired, super-boats. The betting was flying thick and strong between the Americans (Bruce Stone’s GRYPHON) and the Canadians (the McLaughlin/ Wilmer duo on MANDATE). However, the knock-down, drag’em’out fight never materialized. It was simply a lopsided win all around, nearly a “white-wash” of the fleet. After posting four-straight bullets in the first four races, the regatta was over according to MANDATE. Many teams were shell-shocked, psychologically decimated, people were seen walking around like zombies, mumbling tuning numbers in their nightmares. 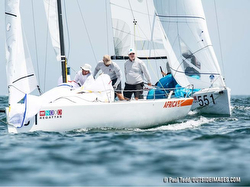 In the end, Terry McLaughlin and Rod Wilmer’s MANDATE, from the Royal Canadian YC in Toronto, Ontario, went wire-to-wire to earn their unprecedented third J/105 North American Championship title in five years. Their team, including Sandy Andrews, Fraser Howell, Ian Howes and Andrew McTavish, won seven of the 11 races and never finished out of the top three. Their 16 points in the no-throw-out series were nine better than Bruce Stone’s GRYPHON crew (St Francis YC in San Francisco, CA and from Harbor Springs, MI) that tallied 25 points. Bill Zartler’s DEJA VOODOO crew from Lakewood YC in Houston, TX took third place with 31 points. 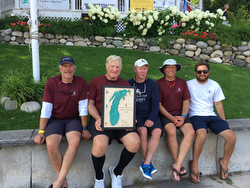 All three teams reigned over the top three in nearly every race of the four-day Championship, hosted by Little Traverse Yacht Club in Harbor Springs, MI. Congratulations to Clark Pellett’s SEALARK that won the combined award for the highest finish in the J/105 Cass in the Chicago Mackinac Race and the J/105 North American Championship. MR BILL’s WILD RIDE Indeed! The J/35 N.A. Champion! (Cheboygan, MI)- What a year it has been for Bill Wildner. After re-uniting with his soul in New Zealand, hiking the mountains and fjords of the spectacular South Island to connect with his inner-consciousness, he returns enlightened, to sunny, quaint Detroit and proceeds to sail “lights out” against his many friends in the J/35 class on the Great Lakes. Not that he hasn’t done it before, but the complete white-washing of the J/35 North Americans will surely stand out in many people’s memories for years to come in the thirteen-boat fleet that experienced a “master-class” in how to win a regatta. Starting off with two bullets, Bill Wildner’s crew on MR BILL’s WILD RIDE posted a 4th in their third race and damn near had a cardiac arrest. Fourth? OMG. Heresy. 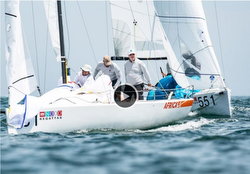 So, duly awakened to their potential mortality, Mr Bill and crew simply smoked the fleet and never looked back, posting six straight bullets to simply dominate the 2018 edition of the J/35 North Americans. They might as well have been walking on water by the end and declared “peace & love” for all. The North Star Sail Club in Cheboygan, MI was the host for the event on the beautiful northeast shores of Michigan on the verdant green waters of Lake Huron. Aside from the Wild Riders, the battle for the balance of the podium went down to the last three races. Sitting in second, based on a discard race, Mike Sabinash’s crew on SABOTAGE just had to avoid another deep race to stay in the silver. However, their first race DNF was going to come back and haunt them. Bill Vogan’s crew on MAJOR DETAIL knew those numbers and their worst race was a 5th going into the last three races. As a result, a few well-planted tacks pushed their competitor down the ladder, never to recover from them. Vogan’s MAJOR DETAIL closed with a 2-2-2 to take the silver over Sabinash’s SABOTAGE that closed with a 4-7-4. Rounding out the top five were Dave Timmer’s HAT TRICK in 4th, just two points ahead of Cheryl Miller’s DEAN’s LIST in 5th place. “I have always had a great time whenever I have gone to Michigan. It is because the people there are so welcoming and so much fun, but, also because my visits there have always had something to do with sailing and sailboat racing. The North Shore Sail Club hosted the event by moving their home base far North from Lake St. Clair near Detroit to Cheboygan, the juncture between Lake Huron and Lake Michigan- an ideal venue for the event. What a great job the NSSC did hosting about 150 sailors, race committee, and families so far from home and running nine races in three days. Hats off to Event Director Dean Fitzpatrick, the race committee and jury for excellent race management. Also his shoreside team for dinners and all evening gatherings that everyone attended at an F.O.E. Hall next to our motel which seemed to be taken over by J/35 sailors for the weekend. The boats all stayed in the same marina on the Cheboygan River a short walking distance away. Local Cheboygan residents were genuinely glad to welcome J/35 sailors, and would go out of their way to say so. And many thanks to Fran DiPietro for organizing my ride on his seaplane from Traverse City Airport to Cheboygan and back. My special thanks go to Amy and Tim Ross for having me aboard their BLACKHAWK for Saturday’s racing. What a kick that was trimming the main sheet for four races with such a jolly crew consisting of Kara Askew, Mark Esch-Williams, Morgan Frakes, Shawn Hughes, Susan Mort, Jenny Robinson. We were no match for the almost flawless team of Bill Wildner and Mr. Bill’s Wild Ride, and the top six teams who had close finishes in almost every race. But, it was fun to race on a boat where everyone was so positive and functioned well as a team. (Santa Barbara, CA)- The prognosis for this year’s Santa Barbara to King Harbor race, hosted by Santa Barbara YC & King Harbor YC, was full of gloom and doom. NOAA’s weather forecasts were for no wind all day, holes everywhere, but maybe filling in from the south late in the day. However, as usual, the NOAA models were somehow 100% wrong, again. The race became a near textbook scenario, a slow build in the morning for sure, but by the time the big boats were rounding Anacapa Island 32nm downstream, the winds were in the northwest 17-19 kts range and by the time the fleet leaders made it across the 10nm dash to Point Dume on the Malibu shoreline, gusts were over 20 kts. Most fleet leaders then gybed onto starboard tack and headed straight for King Harbor, playing the windshifts towards the end of 45nm section. For the fastest J’s on the track, the twin J/125s in ULDB C Division, it was a duel to the finish. Dr Laura Schlessinger’s WARRIOR led at the first turning mark- Anacapa Island- turned left and raced to Point Dume planing most of the way. Then, gybed onto starboard off that point and led into the late evening hours going into King Harbor. However, after a few gybes, the wind getting lighter, Viggo Torbensen’s well-oiled offshore machine- TIMESHAVER- executed a few slick moves, faster sail changes, and rolled over Dr Laura’s WARRIOR right near the end. WARRIOR had changed to a Code Zero in the lighter going, but could not change back to the A2 asym fast enough. As a result, TIMESHAVER crossed the line just 2min 12sec ahead of WARRIOR, taking 2nd and 3rd in class, respectively. 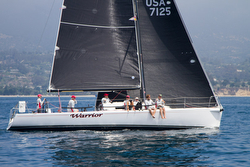 On a PHRF Overall basis, it was so close that TIMESHAVER took 2nd Overall while WARRIOR was 5th Overall. In the ULDB D Class, Bernie Girod’s J/111 ROCK & ROLL was 2nd (slipping into 4th overall between the J/125s), Kenny Kieding & John Vincent’s J/111 ARGO 3 was third (14th overall), Seth Hall’s J/124 MARISOL was 4th, and Doug & Jack Jorgensen’s J/111 PICOSA was 5th. The ULDB E Class saw Dan Murphy’s J/105 CUCHULAINN take 5th place, while Doug Stelck’s J/100 JIB & TONIC was 7th. (Algarrobo, Chile)- This past weekend (July 28-29), Juan Reid and crew onboard J/70 #1 WINDMADE, won the first weekend of the Santander Bank Chilean J/70 Winter Series that is being held in Algarrobo Bay. With great winter conditions- sunny days, 16 degrees Celsius, 8-12 kts and flat seas- nine boats sacrificed a couple of ski days and got together in Algarrobo for a weekend of sailing. Also, due to the temperature and the wind direction, it was much tighter racing than normal, as the favored lefty wind shifts on the left side of the course never showed up all weekend. After the first two races on Saturday, the anticipated fight for the lead materialized between WINDMADE and MORENITA. Finally, the Doyle team from MORENITA, with lots of learning after the last Doyle clinic in Marblehead, MA (USA), was leading after the first day of sailing with a great day of good starts, great speed and good tactics! On Sunday, WINDMADE started off with two bullets (thanks to half the fleet been over the line at the gun and having to get back to start). As a result, that put MORENITA in a complicated situation, making it harder for them to win the weekend. In the final race on Sunday, WINDMADE had an average start with MORENITA to leeward, forcing WINDMADE to tack clear. However, WINDMADE found better breeze and clear air in the middle of the course, rapidly closing the distance upwind, then closing to a half-boat length at the leeward gate after a smart downwind run. On the second beat, WINDMADE passed MORENITA on a wind shift. In the final approach to the windward mark, some boats didn’t notice the change of course, with WINDMADE taking advantage of the situation. In the final approach on the port tack layline, SENSEI overstood, but with full speed, established an inside overlap at the 3-boat length zone over WINDMADE. At the mark, WINDMADE closed the gap too much, forcing SENSEI to touch the mark, so SENSEI screamed “protest”. With MORENITA farther down the standings, the WINDMADE crew made the sensible/ wise decision to “spin” their circles, dropping from 3rd to 6th in the race, just one place behind MORENITA. With one final leg to finish the race, WINDMADE managed to sail deeper than MORENITA and, with great tactics from Rodrigo Amunátegui, managed to gybe at the right moment, getting the righty and better breeze on the center right of the course to get back to 3rd at the finish line! A dramatic comeback for the ecstatic, wildly cheering, WINDMADE crew! In the final scoring, WINDMADE won the weekend with 9 points; Vernon Robert’s MORENITA was second with 11 pts; and Víctor Lobos’ LEXUS was third with 13 pts. 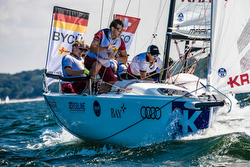 The balance of the top five included the Doyle Sails team on PELIGRO, skippered by Alejandro Pérez, in fourth place and Marcos Fuentes’ SENSEI in fifth. 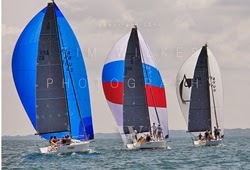 In the Corinthians Division, Diego Natho’s TRILOGIA won; truly a family affair, sailing with his Mom, Dad and brother!! Taking second was Cristián Pérez’s ELEANOR RIGBY. The second date of the Santander Bank J/70 Winter Series will be 25-26 August, hosted by Cofradía Náutica del Pacífico, in Algarrobo. 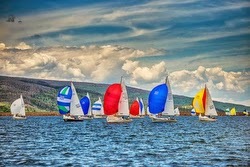 (Harbor Springs, MI)- As they have done in the past, the Little Traverse YC’s famous “Ugotta Regatta” lived up to its “fun in the sun” promise, giving the sailors all they could have wished for and more over the three day weekend. Sailed on the pristine Caribbean-blue Little Traverse Bay on the upper northwest part of the Michigan peninsula, the event hosted a big fleet of J/70s, a one-design fleet of J/111s, and a host of larger J’s sailing in the ORR and PHRF offshore classes. The twenty-one boat J/70 fleet was unusual in that over 95% of the sailors were Corinthian boats. In fact, Sarah Berteau’s BERTEAU GROUP won both the regatta overall and the Corinthians Division, winning with just 15 pts in 8 races sailed! Second was Jake Christy’s PALE HORSE, also taking second in Corinthians, and closing out the podium was the first pro-team, Bill McKinley’s DENALI 0.5. The balance of the top five saw Scott Sellers’ TRES BURRITOS in fourth (3rd in Corinthians) and Polk Wagner’s ESCAPE in 5th position. Winning the J/111s was the triumphant trio on KASHMIR (Karl Brummel, Steve Henderson, Mike Mayer) with four 1sts and a 2nd for just 6 pts total. Second was Brad Faber’s UTAH mirroring KASHMIR’s finishes for 9 pts total. Taking the bronze was Carl Hanssen’s VARIANCE with 16 pts. It was nearly a clean sweep in the nine-boat ORR C fleet for J/crews. Winning was Matt Songer’s J/122 EVVAI with two bullets, followed by Bob Mampe’s J/122 GOTTA WANTA with a 2-4. Sitting in fourth with 7 pts was Geoff Briede & Jeff Clark’s J/120 SCOUT. FM J/70 Lake Ontario Top Dog! (Youngstown, NY)- The Youngstown YC hosted yet another awesome CanAm Challenge Regatta on western Lake Ontario this past weekend. The fun and games included an “impromptu” (but, fiercely fought) street hockey game along the waterfront parking lot between Canadian and American sailing teams; bragging rights for North American supremacy again go to the Canadians with a 2-1 victory! Perhaps the consolation prize goes to the Americans for winning the principal J/one-design classes- the J/70s and J/88s. After eleven races, it was quite apparent who was going to become the 2018 J/88 Great Lakes Champion. By winning the first three races and closing the last day with a 1-1-2, Laura Weyler’s HIJINKS had a seemingly unassailable control over their 88 colleagues in terms of tactics and speed. Their record was six 1sts and four 2nds for just 14 pts net! A distant second, like in the next county, was Tim Finkle’s SEAWEED, winning the fight for the silver in a nail-biting, anxiety-ridden final race over Iris Vogel’s DEVIATION. The women skippers are sailing fast in the 88’s, as Cindy Goodin’s QUIXY took 4th and Tim Sweet’s Canadian crew on GIVE’R was fifth. Also sailing an amazing eleven races over three days was the largest class in the event, the dozen-boat J/70 class. Tod Sackett’s FM crew sailed the most consistently, posting all podium finishes as his counters to win with 19 pts. The balance of the podium was determined by a tie-breaker at 24 pts each, with Travis Odenbach’s USA 40 winning the countback over Kevin Morgan’s WILD CARD. As anticipated, the duel in the J/22 class of a half-dozen boats would come down to Vic Snyder’s MO’MONEY and Mark Sertl’s MONEY FOR NOTHING, the outcome poetically determined by tie-breaker on 8 pts each! Snyder’s crew got the win based on the most 1sts. Third was Trevor Collins’ ALTERNATIVE GIRLFRIEND team from Canada. (Edgartown, MA)- Edgartown Yacht Club’s ‘Round-the-Island Race (’RTI) – one of America’s oldest distance races– took place Saturday around Martha’s Vineyard. The 80-year-old race originated in 1938 and, except for the years of the Second World War, has been an annual event since then. It is part of the Edgartown Yacht Club’s Edgartown Race Weekend, which includes two days of buoy racing (tomorrow and Friday) and a ‘Round-the-Sound Race that began immediately after the start for the ’RTI. Starting at 0800 Saturday morning, the ’RTI fleet (split into classes for Classics; PHRF A, B and C; PHRF Non-Spinnaker and Double-Handed) sailed between Martha’s Vineyard and Nantucket along the east beach of Chappaquiddick. At midday, the fleet headed into the open Atlantic Ocean off the south coast of the Vineyard. In the afternoon, after rounding the gorgeous cliffs of Gay Head, the sailors then headed up Vineyard Sound to the finish near Edgartown Harbor. The fleet passed within sight of seven lighthouses: Cape Poge, Gay Head, Tarpaulin Cove, Nobska, West Chop, East Chop and Edgartown. 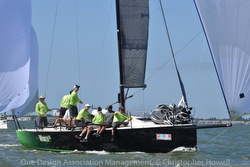 Douglas Curtiss’s J/111 WICKED 2.0 won PHRF A while Rick Egan’s J/46 WINGS took third place on the podium. 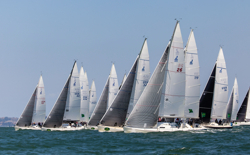 Winning the largest class- PHRF B- and leading a J/Boat sweep of the top five was Ed Dailey’s (Beverly, Mass.) J/109 RAPTOR. “It was a terrific race,” said Dailey, who has competed in the race seven times and has won his class twice now. “It always has so many different conditions, and the Vineyard is a storied place; it’s kind of magical.” Just behind was an amazing tie for second place between Stephen McManus’ J/120 SAYKADOO and Eliot Shanabrook’s J/109 HAFA ADAI. Fourth was Stephen Besse’s J/120 APRES’ and fifth place went to Ned Joyce’s J/105 DARK’N’STORMY. Finishing third in PHRF C class was Ira Perry’s J/29 SEEFEST while Steve Dahill’s J/35C RIVA took 4th in class. Finally, Alan Fougere’s J/160 AVATAR finished 4th in PHRF Non-spinnaker class. (Hamble, England)- Five of the nine events for the 2018 J/70 UK Class Grand Slam Series have now been completed. 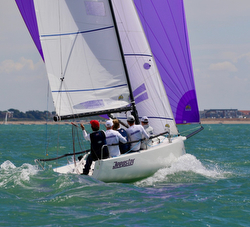 The fifth event was the GJW Direct J/70 UK National Championship. Held 20-22 July, the national championship was a non-discardable event for the Grand Slam Series. The Grand Slam Series was set out to galvanize the J/70 UK Class to promote more teams racing at organized events. Just over half way through the series, a total of forty-one J/70 teams have been racing. The average number of teams on a start line has been twenty-five, and those teams have competed in thirty-seven races. 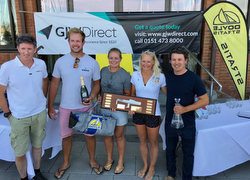 Doug Struth’s DSP, with Geoff Carveth on the helm, leads the Grand Slam Series with five scoring regattas completed, and was the winner of the Corinthian Class at the GJW Direct J/70 UK National Championship. “The UK Class still has work to do if we are going to compete with the best teams in the world. 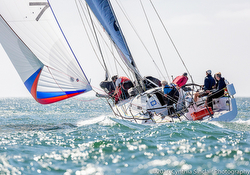 However, we are making progress towards our aim of getting UK teams onto the podium for the 2019 J/70 Worlds in Torbay,” said Geoff Carveth from DSP. In the 2018 J/70 UK Class Grand Slam Series, Ian Wilson & Marshall King’s SOAK RACING is in second place and is yet to score in five events. Clive Bush’s DARCEY & Martin Dent’s JELVIS are tied for third, and have yet to score in five events. 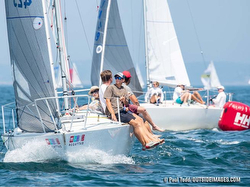 David McLeman’s OFFBEAT has declared five Corinthian events and is in fifth place, just ahead of Tim Collins’ Corinthian team racing VELVET ELVIS. 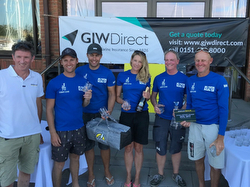 Congratulations to Mark Lees and his young team from the Royal Southern YC, who won the GJW Direct Open J/70 UK National Championship in a fleet of 38 teams. Mark Lees’ team literally went sailing in their J/70 Serious Fun for the first time, in the first race of the Nationals. 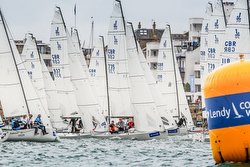 The sixth event of the 2018 J/70 UK Class Grand Slam Series will take place 4th to 8th of August as a mini-series during Lendy Cowes Week. 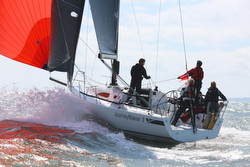 There will be one-design racing for the duration of Lendy Cowes Week. The J/70 fleet will form the largest sportsboat fleet at the world famous regatta with 38 teams already entered.